Treasure Island weddings can be romantic, intimate and inexpensive. 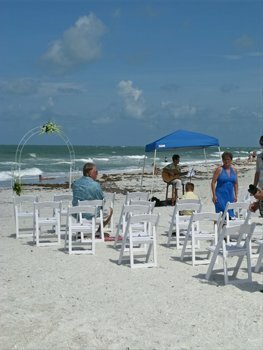 You can have a cheap Florida beach wedding at Sunset Beach Pavilion on Treasure Island FL. More and more brides here on the Gulf Coast Florida beaches are drawn to the simple beauty and naturalness of being married on the white sands of a local beach. Treasure Island is a perfect fit. With its super-wide beaches, its preponderance of hotels and motels, and the inexpensive rental of Sunset Beach Pavilion , Treasure Island FL is hard to beat. The setting is beautiful and you will not need to make an investment to add a lot. Being married in the tropical outdoors is a memorable experience. The wedding party and list of guests is small. They get to wear casual clothes. Shorts and Hawaiian aloha shirts are plentiful. How much more simple can it get when you have friends arrange a small amount of plastic chairs, hire a young musician dying to perform, and inviting everyone to wear flip-flops? Friends and relatives from out-of-town are introduced to the casual Florida beach lifestyle. The minister gets to dress down, join a loving couple under the Florida sky, and hold a a wonderful memory for the rest of their life. * It is best to schedule your wedding a little after sunrise or within an hour of sunset. The beach is much cooler and there are less random onlookers. * Give the musician instructions to cut off his song list when the bride is within a 100 yards of the aisle. He doesn't have to complete all six stanzas of a piece while the bride and everyone else waits. Couples these days are becoming more competitive about planning an inexpensive wedding. They are really questioning expense on things like a $900 cake, or a $1500 gown. 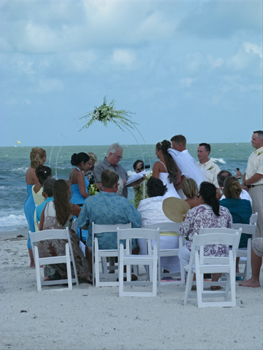 The nice thing about a Florida beach wedding is that it can be done cheaply with good planning. * The bakery at the local grocery is now becoming the starting point for pricing wedding cakes. Begin early in your search. Once you find a store to make your cake, become a regular customer and develop a relationship with the bakers. * Get to know the produce manager at the local grocery. Tell him about your plans for a beach wedding and your idea of serving fresh fruit slices at the reception. Get his recommendations on when to purchase, and how to store and serve. * Once you find a location for your wedding, your first order of business is to talk with the City of Treasure Island about everything you will need to make your wedding go off without without surprise problems. It is easy to see why Treasure Island weddings are becoming much more popular with couples today.